← Grip Gripes- Can I Actually Come Up with Legit Complaints About my Grip EQ? 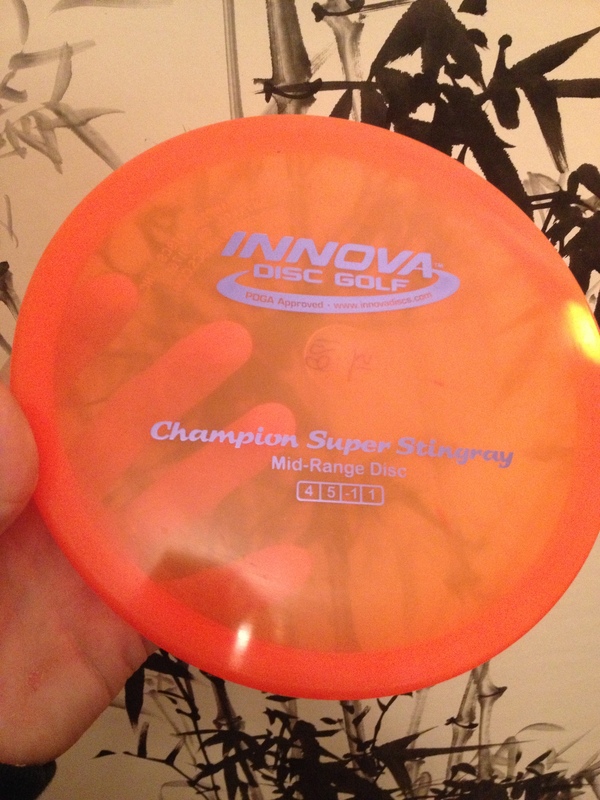 And so begins my review of the Innova Champion Super Stingray! Let me get the frivolous stuff out of the way first: their first initial run of stamps are ugly. The discs with the three separate small stamps (like the blizzard discs) is not aesthetically pleasing, not creative, and not something I will put in my bag. Thankfully they printed another version more like their traditional Champion discs (the picture I posted is the one I own). Also, the name of the disc is misleading. “Super” Stingray implies it’s been beefed up and is going to be more stable, faster, and better in every way. They market the disc as a slightly straighter version of the Stingray, which may be appealing to some buyers- but to me this seemed a bit backwards. Why do people throw the Stingray??? FOR AN UNDERSTABLE TURN!!! Nobody pulls a Stingray out of their bag, one of the most understable midrange discs produced, and says, “LOOK HOW STRAIGHT THIS DISC FLIES!” On the contrary, they are counting on the disc to turn for them. Super Stingray rim profile- it’s tough to see in the pic but the rim is much more filled out compared to many midrange discs. Next I’ll just mention some quirks about the disc that I enjoy, which may be different for other folks. I love the rim size. The rim shape isn’t super thin (like the Wedge) or thick (like the Gator) and is perfect for the controlled fan grip. Many players mention the Meteor or Comet from Discraft for their go-to turning midrange, but I don’t like the rim on those discs. The Super Stingray’s rim is more filled out and substantial. 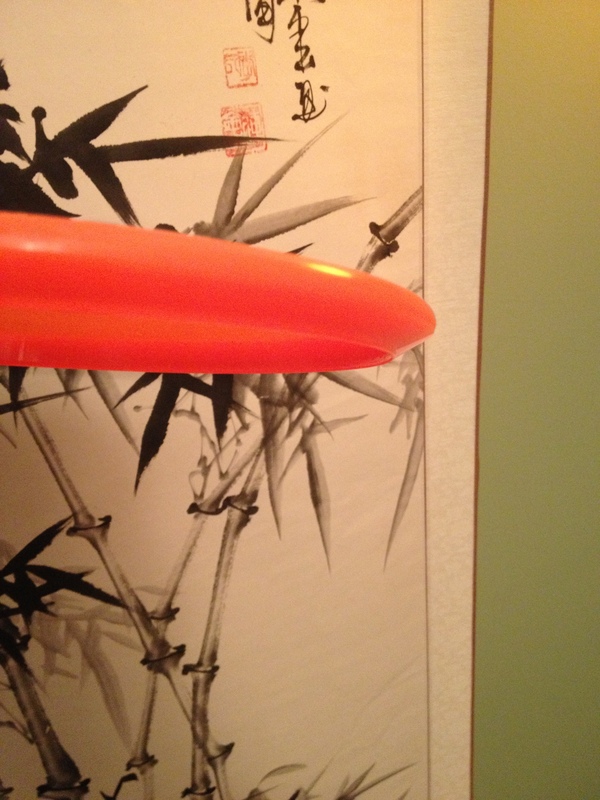 Also, it’s large diameter size in the Champion Plastic leaves it with a gummier feel than other Champion discs. It’s similar to the way a 150g class Champ Teebird is gummier than a max weight 175g version- though not this extreme. The long and short is that I like the way this disc feels. Where does this leave me? What do I really think of this new-ish offering from Innova? I approach this disc from the perspective of needing an out of the box turning midrange. Remarkably, this is exactly what I’ve got! My arm-speed (decent, but graceful if I do say so myself), and skill level (4th year player) seem to get a pleasing result from the Super Stingray. I enjoy throwing a traditional Champion Cobra for straight shots in the woods; and as of late I have used a beat DX Ontario Cobra for turning shots. However, my beat DX Cobra is so beat that it tends to just dive and die. This Super Stingray has really impressed me by taking over the role of my DX Cobra. Not only is it premium durable plastic, but it has enough stability to resist the “dive and die” situation. If I throw the Champ Super Stingray with no power, it’ll fly straight and hyzer out (I am talking “NO” power!) like every other disc on the market. However, if I step up with confidence and choose a line to throw it on- the Super Stingray will fly a touch straight and then turn for a good distance before losing speed and fading just slightly as it loses height. There are shots that HAVE to go right (for a RHBH thrower) and in those cases I’ll use an understable putter or a flick. There are also shots that SHOULD go right and for those I have been throwing the Super Stingray and enjoying the results. A few shots in the beginning had me guessing at how much turn I could get, and that’s a given with any new disc, but now that I’ve thrown it more than a handful of times it’s actually worked it’s way into my bag. My midrange disc set up has improved with this new offering from Innova. My recommendation to people with this disc is to give it a shot if you’re not settled on a turning midrange. The Champion plastic will give you consistency and the rim may be something you didn’t realize could add accuracy. Innova pushed this disc out at the same time as their “King Cobra” which was another slight change to a beloved classic. While I don’t know much about the King Cobra (yet), I will say that the Super Stingray does a good job of being a close relative of the original Stingray. In my opinion, it’s a guessing game for Innova to find out exactly how under-stable is the right amount to put into a disc- and with this disc they’ve done a decent job. If you really want to test it out, get one and throw it on a straight line and see how it flies for you. For my right turning midrange shots which are slightly more aggressive than a typical touch shot, this disc fits the bill! This entry was posted in Equipment and Gear and tagged champ, champion, disc, golf, innova, review, stable, stingray, super, turn, under, understable. Bookmark the permalink.